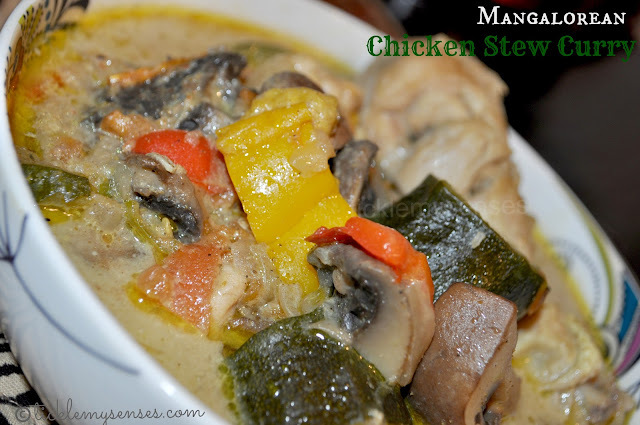 Tickle My Senses: Mangalorean Chicken Stew with vegetables and a Cook book WINNER!!. 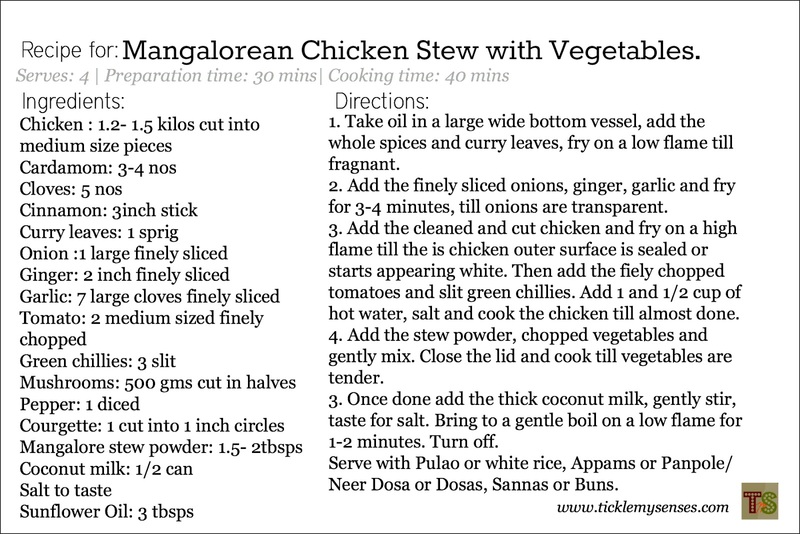 Mangalorean Chicken Stew with vegetables and a Cook book WINNER!!. No Mangalorean Food Blog is complete without a good Chicken Stew Curry recipe. I have no idea why it has taken me so long to put up this much loved and in demand recipe. This Mangalorean Chicken Stew Curry is so simple, yet so beautiful. It uses the basic store cupboard whole spices and is jazzed up with the mild, yet unmistakable Mangalore stew powder. 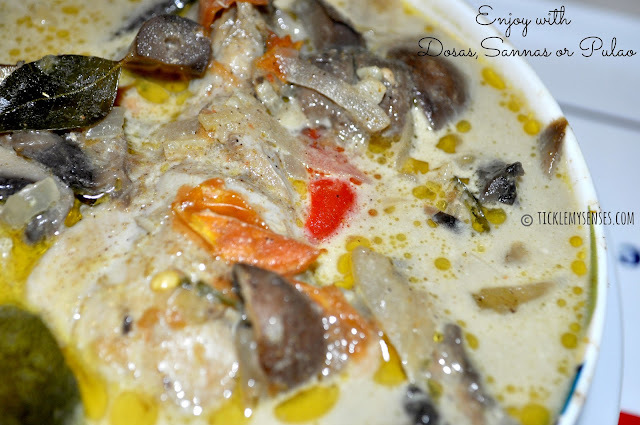 My version is loaded with vegetables (as I did not want to make a seperate side vege!) . I used my favorite mixed coloured peppers, brown button mushrooms and courgettes, but you could use potatoes, carrots, broccoli, drumsticks or anything you fancy. Think of all those wonderful antioxidants, vitamins, nutrients and fibre you will be treating your body to :). To top it all, this flavourful curry is transformed to a silky, luscious gravy by the final drizzling of Coconut milk. Hmmm.. Do give it a go, I promise...you will not be dissapointed. Serve the stew with some plain or pulao rice, Dosa, Neer dosa/ Panpole, Appams , Sannas (recipe coming soon) or Simple Buns. Mangalore stew powder is readily available in most Mangalore stores. It is one of those must have spice blends I do not leave home without. Alternatively you can make your own very easily by roasting a few whole spices, grinding them fine and storing it in airtight containers in the fridge to keep it fresher for longer. Recipe for M. Stew powder here. I would love to know how you enjoyed it. Do drop me a line :) at the end of this post or at carol@ticklemysenses.com. And the Winner of Annabel Karmel's 100 Family Meals chosen randomly is GILLIAN SANJAY ! Hearty Congratulations!! I do hope this book will inspire you with many Family meal ideas. I so look forward to sending you this book so please email me your postal address to carol@ticklemysenses.com, within the next 72 hours. For all my lovely Foodie friends who participated and did not win, thankyou and do not despair, for very soon I will be having another wonderful CookBook Giveaway .